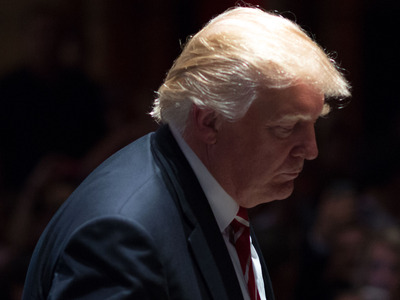 Donald Trump’s poll numbers are plummeting — and even the presumptive Republican nominee himself has acknowledged it. In the latest RealClearPolitics average of several polls, Trump trails Hillary Clinton, the presumptive Democratic nominee, by 5.8 points. It’s a 6-point reversal from a month ago. The fall in fortune comes after a Bloomberg poll released earlier this week, in which he trailed Clinton by 12 points. And polls from Reuters and CBS News showed Trump behind by 9 points and 6 points, respectively. The presumptive Republican nominee has fallen behind to Clinton in 12 consecutive polls posted to the site. Less than a month ago, Trump’s future was looking brighter against Clinton in their general-election matchup. 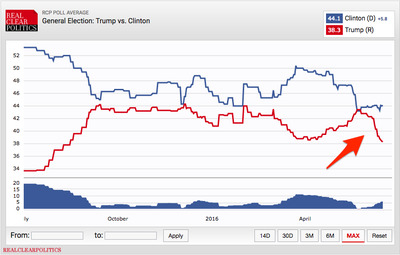 As recently as May 25, Trump led Clinton in the RCP polling average by 0.2% — the first instance of the Manhattan businessman leaping ahead of Clinton in the coveted polling average. But, as Trump has taken hits for his attacks on a federal judge over his Mexican heritage and a controversial response to last weekend’s Orlando terror attacks, his poll numbers have taken a nosedive. At 38.3%, Trump’s average support in a one-on-one matchup against Clinton is the lowest it’s been since August 15 — just two months after he launched his campaign last year. As a result, Trump has recently dropped his poll numbers as a talking point during recent rallies. He conceded in a phone interview with New York Times reporter Maggie Haberman that his poll standing isn’t so hot.